The field of power electronics has grown rapidly in recent years due to a number of trends. Technological innovations in high-power transistors and permanent magnet motors have increased power capability, reduced size and cost, and made new applications feasible. From electric motor applications to position control applications, the motor drives adjust to the needs of the process and help increase overall efficiency of the system. Calnetix’s Vericycle™ Bidirectional Drives are optimized with the whole system in mind. In particular, the drives have features that maximize the efficiency of the power electronics, such as space vector modulation and dynamic deadtime insertion in the switching patterns of the power devices. Additionally, the total harmonic distortion (THD) of the machine currents and grid side currents are low. This reduces the losses in a machine that is connected to the drive, which in turn, increases the efficiency of the machine. Since Calnetix can provide a custom drive and machine, the back electromotive force (BEMF) of the machine can be optimized for the required DC bus voltage of the drive and the grid voltage. As a result, the entire system efficiency is optimum. Calnetix’s Vericycle™ drives are designed to drive high-speed machines and machines with low impedance. This is achieved by switching the power devices of the drive at a high frequency that is synchronized to the fundamental frequency of the machine. Consequently, the fundamental frequency of the machine can be high without incurring a large distortion in the current that is drawn by the machine. The distortion is further decreased by dynamically adjusting the inserted deadtime in the switching patterns of the power devices. In addition, Vericycle™ high frequency drives include a simple inductance filter, which further reduces the distortion of the current that is drawn by the machine. In fact, the filter limits the maximum distortion of the machine currents. In other words, the drive does not need to rely upon the machine inductance to limit the distortion in the currents that are drawn by the machine. The combination of high switching frequency that is synchronized to the fundamental frequency of the machine, dynamic deadtime insertion, and a simple inductance filter make Calnetix’s Vericycle™ high frequency variable speed drives an ideal choice for low-impedance and high-speed machines. The Calnetix power electronics grid tie sensorless controller is a space vector modulated inverter connected to the three-phase grid through one series inductance per phase, which acts to reduce the switching harmonics entering the grid. Large inductance and high switching frequency is used to minimize the switching harmonics into the grid. The control is robust and stable across a wide range of operating conditions. It also has good tolerance to the grid voltage unbalance and waveform distortion. The grid control system implements two major control loops: inner current control and outer voltage control. The outer voltage control is used to regulate the DC bus voltage to the predefined value. The inner current loop is used to regulate the magnitude and phase angle of the current to and from the grid. D-axis and Q-axis currents are de-coupled and then regulated separately by current controllers. The primary aim of the control is to transfer current (power) from the DC bus to the grid with unity power factor, and vice versa. The reactive current (power) also can be adjusted if required. Sensorless field-oriented control (FOC) with space vector modulation is employed for the control of the grid interface. The sensorless scheme uses a virtual flux estimator for better noise immunity, together with a phase lock loop (PLL), which is able to track grid frequency and angle smoothly. Therefore, even when the grid frequency drifts, the control still follows the voltage waveform and input or output power with unity power factor. By eliminating the noisy grid voltage sensors, the control is more stable and robust. The control has ground fault protection. In the event of a ground fault, the control will shut down. External protective relays, such as Beckwith or Basler protective relays, can also be used for anti-islanding and other grid interface protection. Calnetix offers fully bidirectional drives. This is achieved with the use of an active grid-tie inverter in addition to the motor drive inverter. While most motor drive inverters are inherently bidirectional, many drives utilize either a fully passive (diode-bridge) or semi-controlled (SCR bridge) grid converter. These converters are unidirectional only; they are only capable of providing energy flow in one direction. While this approach may be suitable for pure motoring applications that utilize a dynamic brake resistor for motor braking, this approach does not work for generating applications. By utilizing an active grid-tie inverter, both motoring and generating applications can be seamlessly implemented without requiring any additional hardware, such as a dynamic braking resistor. Calnetix’s Vericycle™ drives produce low total harmonic distortion (THD) in both the motor side currents and in the grid side currents. The same attributes of the Vericycle™ drives that make them a perfect choice for low-impedance and high-speed machines also allow them to produce low total harmonic distortion. These attributes include switching the power devices at high frequency that is synchronized to the fundamental frequency of the machine, dynamic deadtime insertion, and a simple inductance filter. This is true not only for the drive side inverter but also for the grid side inverter. Limiting the maximum distortion in the currents that are drawn from the grid and by the machine in effect minimizes the total harmonic distortion. Minimizing the total harmonic distortion is important for machines since harmonic currents produce additional losses and heat in the machine, but do not produce useful torque. Grid operators typically have requirements for the maximum allowable total harmonic distortion that is produced by grid tied inverters; therefore, it is also important to limit the maximum total harmonic distortion that is produced by a drive. Vericycle™ power electronics are able to alleviate both concerns by providing a simple inductance filter for both the grid side and motor side inverters, switching the power devices of the inverters at a high frequency that is synchronized to the fundamental frequency of the machine, and dynamically adjusting the deadtime that is inserted in the switching patterns of the power devices. Reliability and long operating life are at the forefront of importance in the design of Calnetix’s Vericycle™ power electronics drives. This is obtained by keeping the electrical and thermal stresses on the components within the drive to reasonable levels. The reliability of Calnetix drives is further increased by reducing the parts count in the drive. In particular, the avoidance of requiring position feedback from the machine and voltage feedback for the machine and grid greatly increases the robustness of the drive. All Calnetix Vericycle™ power electronics go through rigorous electrical and thermal testing before they leave our factory, minimizing manufacturing and component infant mortality issues. High reliability, reasonable stress levels and rigorous testing result in the long product life spans of our variable speed drives. Calnetix Vericycle™ drives incorporate sensorless space vector modulation. The drive is sensorless in the context that no physical sensor for the machine rotor position is required. A sensorless drive is more reliable, less prone to high frequency electrical noise from the machine and requires less parts compared to a drive that requires position feedback. Calnetix’s power electronics utilize a virtual flux estimator and phase lock loop instead of a voltage estimator for determining the machine rotor position. This scheme provides better noise immunity compared to a voltage estimator, has excellent dynamic response, is relatively insensitive to disturbances in the line voltage, and is able to track the position smoothly through zero speed. Space vector modulation is used to increase the utilization of the internal DC bus of the drive. A high DC bus utilization is particularly important for optimizing the efficiency of the drive and machine, since it allows the back electro-motive force of the machine to be increased. This leads to lower machine currents, and therefore, lower losses in both the drive and machine. Incorporating sensorless space vector modulation produces a simpler, more robust drive that maximizes the efficiency of both the drive and connected machine. Calnetix’s Vericycle™ drives are re-programmable in order to meet the requirements of new applications. This is achieved through the use of generic embedded software and unique parameter files that are customized for a particular application. Typical drive characteristics, such as current limits, overspeed limits and acceleration rates are readily changeable. For applications that require unique capabilities, the embedded software also can be modified. The ability to re-program the embedded controllers coupled with the ability to customize the drive hardware allows our drives to meet the needs of different applications. Typically, Calnetix’s Vericycle™ variable speed drives are equipped with an active front end (grid-tie inverter.) This allows for bidirectional flow of power. An active front end also decouples the machine side inverter from the grid since the DC bus voltage in the drive does not vary with the grid voltage. This is unlike drives with a passive front end in which the DC bus varies with grid voltage. As a result, a drive with an active front end is able to be interfaced to U.S. and international power networks (50 and 60 Hz) without having to modify the design of a machine connected to the drive. 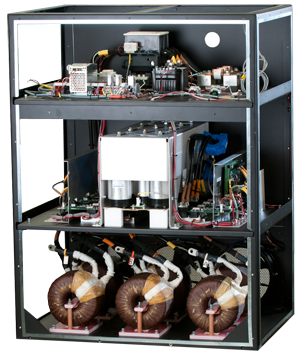 A passive front end (rectifier) is an alternative for applications that only require a unidirectional flow of power into the drive from the grid. A dynamic brake resistor can be added to a variable speed drive with a passive front end for fast deceleration of any attached machine or for protection of the drive for applications with high inertia loads. Other considerations for the choice of the front end include the required total harmonic distortion (THD) of the currents that are drawn from the grid, the power factor and the total cost of the drive. For applications where unity power factor and low THD is required, an active front end is necessary. Calnetix high-frequency drives can incorporate either front end type to meet the technical requirements and cost target of the application.